Geoff, I’ve got a question… I have no problem writing words or a melody but getting them to work together is the problem. Some times they end up maybe one beat off or I need to change time in the chorus. Any ideas? Ok, Let me address this…I've got a personal approach to this problem that works extremely well. Let's say you've written some memorizing lyrics, and also have a really infectious melody line that you want to fit these lyrics into. But you find that there are parts that don't really match up very well. It’s a case of trying to bang a square peg into a round hole. Ever had this happen? Well, here’s what you can do. What's more important to the song? The lyrics or melody line? Let me give you an example so you can see how this plays out. Is preserving the melody line more important here? Or do the exact wording of these lyrics communicate something so powerfully that it shouldn't be changed? 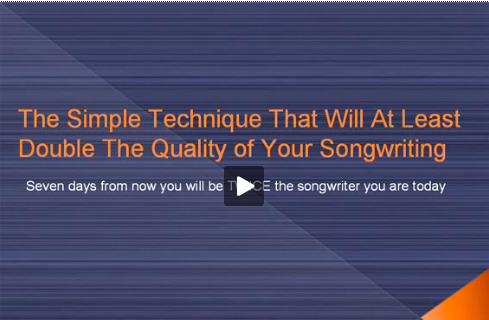 Ask out this question and you’ll find out what's more important to you… Preserving the melody or the lyrics. Once you make this decision, you need to adjust the other element to turn it into a “round peg” so you can bang it straight into the round whole. A snug fit. For instance, if the melody line is so gorgeous that you can’t bare to change it, see if you can adjust the lyrics so they support this melody. You can do this by finding a new word that means the same thing, or even re-writing the sentence so it still has the same meaning - it's just worded differently. Maybe you feel the lyrics are worded perfectly, and they are more important than the melody line. See if you can adjust the melody so these words will fit nicely. It's about making small compromises for the sake of making the song the stunner that you know it can be! Just remember, if it's not working, making a change to either the melody line or the lyrics is going to work out much better than trying to work with two ideas that aren't in harmony with each other! Remember… square peg… round hole. It just don’t work.